Last Sunday, I had a chance to join a potluck party with a fiesta theme courtesy of Clara Ole. Together with the brother and sister team Mhel and Chef Ken Ignacio of Certified Foodies, we had a wonderful Sundate that turned into a fiesta-inspired boodle fight featuring all the special food that they prepared. I met the Ignacios through blogging, the world of sharing our own experiences online, including events which we all love to attend especially when it involves food. But for a couple of years, we haven't seen each other in person and kept in touch only via social media due to our busy schedules. 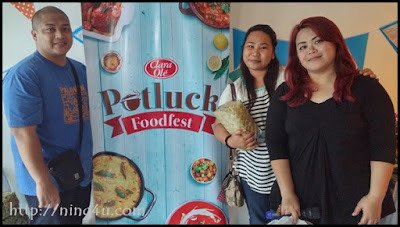 So when the invitation from them came up, I immediately signed up, for it will give me a chance to meet them again and have a taste of all the yummy food that they will prepare using Clara Ole food products. We had BBQ's (Squid and Pork) , Java Rice, Crab, Lumpiang Shanghai, Fried Tilapia, Adobong Balot, Sinigang, Green Mangos w/ Bagoong, Tomato w/ Salted and more..yummminess!!! Since this is a Clara Ole Fiesta, there were also exciting games (Pinoy Henyo, Palengke Day and Agawan Sa Dahon), while we munched food which were made extra special with Clara Ole Dips n' Dressings. Clara Ole has been in the country since 1987. Produced by Sysu International, Inc., Clara Ole offers world-class food products of the highest quality, in convenient packaging, and at very reasonable prices. From the time my mother started to teach me how to cook, Clara Ole has always been present in our kitchen from tomato sauce, spicy marinade, and more. I am born a Bicolana and even if we grew up in Manila, we go back to Naga City every Penafrancia Fiesta, summer vacation, and family gatherings. Whenever we have that chance to stay in Naga City with our next of kin, what else do we do aside from hanging out and catching up with each others' lives? We eat of course! Lotsa lotsa FOOD! Yep, Bicolano cuisine at its best, laid out on a loonggg table! So, if I will be given a chance to have a potluck party like this, I will prepare Bicolano's delicious and enticing dishes and make it more delicious thru Clara Ole's various food products. A Bicolandia themed potluck party, why not? I would love to prepare spicy dishes like the popular Bicol Express and enhance its taste by partnering it with Clara Ole's Ora Mix Mo Specialty Fried Rice Mix (Paella); Spicy Chicken Inasal using the combined Clara Ole's Marinades (Spicy and Inasal); Spicy Barbecue with Clara Ole BBQ marinades; and Spicy Adobo with Clara Ole Pineapple Jam. I will probably include a crab dish similar to the delicious one that Chef Ken did (gaya-gaya hehe..) using Clara Ole Tomato Sauce and make it more spicy. And since my birthday is very..very near, actually it is on August 6, this Leo girl will definitely prepare dishes with Clara Ole products, first and foremost of which will be Spaghetti using Clara Ole's Tomato-based Sauce (Three-Cheese Sweet Style) pala for long life aba! Because we took home Clara Ole products (yeayy..THANK YOU PO!) my friends and relatives will enjoy Bicolano cuisine in Manila on my birthday, with exciting tasteful twists made possible by Clara Ole food products.